If you've been following us for any length of time, then you know we are deep in the trenches of preparing for the annual Christmas Baking Spree! We've made our runs to the various markets to pick up supplies (hello 68 sticks of butter sitting in the refrigerator) and have got all our traditional recipes lined up, along with a few new ones. We did decide to try out one of the new ones, these Chocolate-Peppermint Cookies, and make them for the Weekly Wednesday Treat Day just to make sure the process of making them would be smooth later on. The dough for these wafer cookies ends up being jet-black thanks to the use of Dutch-process cocoa powder - this not only allows the wicked dark color, but gives the cookies a rich chocolate flavor that is more smooth and mild. I do suggest seeking the cocoa powder out as we both found it to blend well with the peppermint bite and provide a striking constrast to its white chocolate wrapper. Rolled quite thin, this dough does tend to warm up quickly - you'll notice a few resting steps in the directions which you can use your judgment on. If you find the dough difficult to work with, pop it in the freezer for a few minutes to firm up - however, if you are in a cool room and work quickly, you may be able to get the business done in a snap. To make sure the cookies bake evenly and keep their shape, I do recommend that you at least don't skip the final freezing step before they go into the oven to bake. With such a dark cookie, doneness isn't as simple as a visual cue of baking until "golden brown" - you should notice a definite chocolate aroma when they are close and if you touch the tops of one or two, the cookies should feel set and dry. Once baked and completely cool, we dipped the entire surface of each cookie in a large vat of melted quality white chocolate. If using real chocolate frightens you, there are a couple other options - almond (white/"vanilla") bark or candy coating could take the place of the white chocolate easy enough. If you'd rather use the chip variety, you may need/want to add a dollop or two of shortening as they don't always melt or smooth out well on their own. 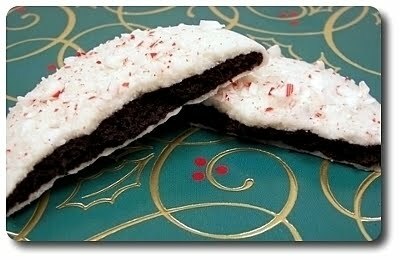 Just after they are dipped, the cookies are sprinkled with crushed candy canes for another peppermint punch, along with extra crunch. If you want to be super clean and fancy, you could sift the candies, giving you plenty of mint-y dust, while keeping the larger pieces aside. Then use just the dust to give the cookies a sparkling finish against the white background - we, however, liked the chunky pieces on the cookies! Jeff noted that he really enjoyed the texture of the cookies - they have a notable snap, but they don't shatter into a million pieces when you bite into them. 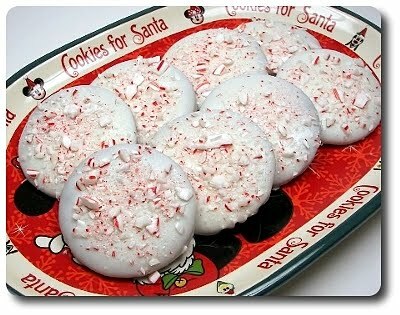 After this trial, I'm very glad we picked these cookies and they are definitely making their way into our gift packages. You could even make the dough ahead of time, cut out the cookies, freeze them raw and keep the rounds, well wrapped, in the freezer to get a jump start. 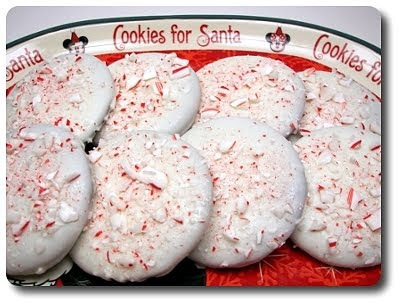 If you wanted, I'm sure you could even bake them ahead of time and keep the naked cookies frozen until you are ready to dip them -I would let them thaw completely before working with them though. 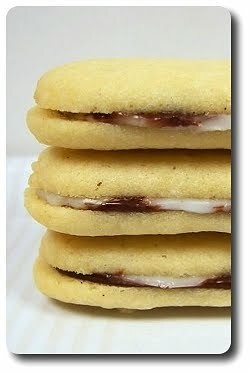 I do have one comment on the cookies themselves after making and baking them off. 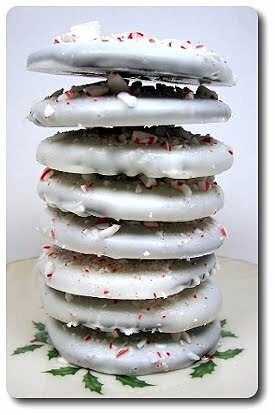 While they are fantastic with the peppermint twist in the dough, if you replaced it with vanilla (and maybe a hint of espresso powder), I think you would have a very close clone to those expensive "famous" wafer cookies! Dark, thin (you could easily roll them a touch thinner too, if desired) and super crisp, with plenty of chocolate to go around, I'm looking forward to giving just the cookies a try sometime - maybe ground up and used as a decadent homemade base for a cheesecake! We hope everyone had a wonderful Thanksgiving this year! Jeff, Gus and I played it low-key at home, spending the time cooking, baking and enjoying the process. We decided to keep the camera in its docking station for the most part, rather than try to figure out how to snap pictures before we ate (though we did take a picture of the dessert as I managed to get that done the day before!). A couple of the recipes were new this year and are definitely worth mentioning, but I do apologize for the lack of pictures. Rather than a giant turkey for just us three, we went with a seven pound turkey breast, making this Turkey Breast with Roasted Garlic and Fresh Herbs. We skipped the injection (we had a brilliant local turkey and felt no need to do this), but we did keep the wicked good garlic and herb butter rub for under the skin. Using fresh thyme, parsley and a bit of sage for the herbs, this was a smashing success - it was done faster using the "convection roast" setting on the oven. This was the first time using the convection setting for a turkey and I'll definitely be using it again - the skin was delectably burnished and very crisp. Besides smashed 'taters (Yukon Golds, with the skin left on of course!) 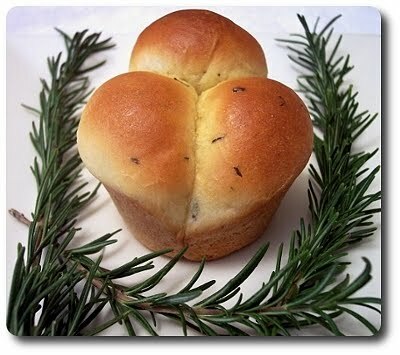 and gravy, we also made those stunning Roasted Garlic and Fresh Rosemary Cloverleaf Rolls. 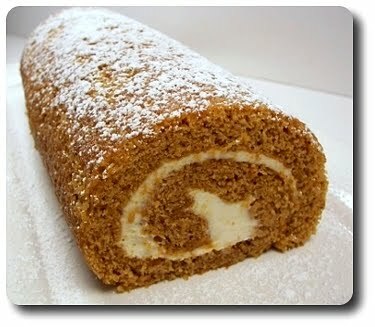 Seriously good - I've tried to make other rolls, but Jeff insists these are always on the table. 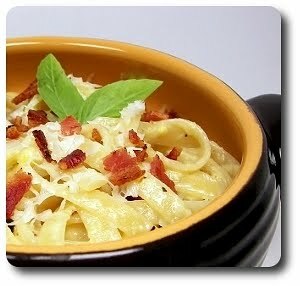 Another new recipe we tried was from the always lovely Kalyn. We've been doing stuffing muffins for the past few years, but when we saw her recipe for Whole Wheat Stuffing Muffins with Sausage and Parmesan, I had the printer humming immediately. There wasn't much changing we did, other than using sweet Italian turkey sausage (tossing a few crushed fennel seeds in with it), swapping out the Parmesan for Asiago cheese and using an ample amount of freshly dried sage (prepared the day before in the dehydrator!). We don't usually add eggs to our stuffing (yes, I realize it should be called dressing - however, "Dressing Muffins" just doesn't have the same ring to it! 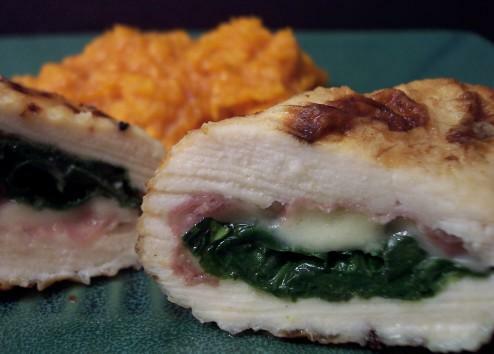 ), but the extra richness and moisture was pleasant and I can certainly see this recipe added to our Thanksgiving tradition. Rockin' job, Kalyn! 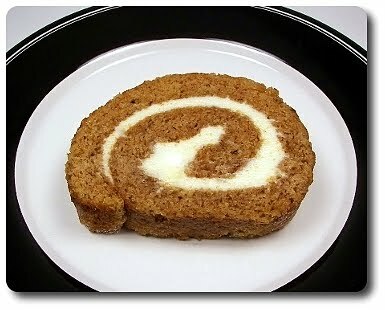 The final new recipe was for a Pumpkin Roll with Cream Cheese Filling. This is the classic recipe from Libby's, which has been on our list for years to make. Jeff decided this was the time to try it and since it was our first go, we decided to stay close to what was called for. 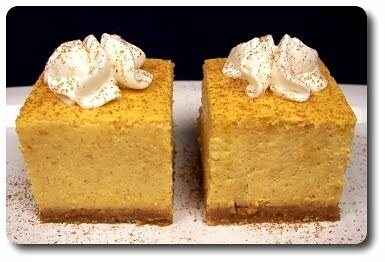 We did add a splash of vanilla, ground ginger and grated nutmeg to the cake batter, along with a pinch of salt to the smooth, sweet filling. Using a lightweight cotton towel to roll up the baked cake, I was quite pleased to see the moist sponge was sturdy, yet pliable enough, to not crack or break and with a generous storm of confectioners' sugar showered over the towel, no sticking either! You can roll up the cake (hot from the oven!) from either the long or short side - we went with the narrow end for a larger, tight spiral as you can see. Jeff requested no nuts, but a cupful of chopped walnuts strewn over the cake batter before baking might be a nice touch of crunch for those who want that! I do suggest chilling the assembled cake for at least a couple hours before serving - this allow the filling to firm up slightly and helps ease cutting. With this being Thanksgiving week, several of Jeff's co-workers won't be in the office for the weekly Wednesday treat day item. Since there should be at least few people there, we did still make a smaller treat to bring in and while it won't be new to us, it will be to them! Before I could even think about what would be good to prepare, Jeff chimed in with "I already have an idea! 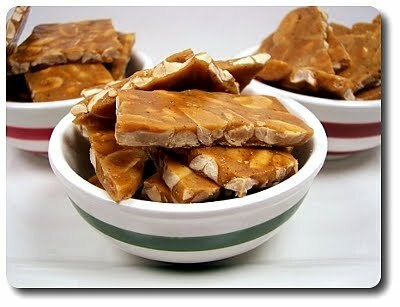 Let's do that crazy Chipotle-Maple Peanut Brittle!". I had to remind him that this wasn't only for him and he would have to share - he pouted for a minute, but then agreed and said he would do his best to not horde it all. I did update the directions slightly in the recipe. First is pan selection - when you pour the molten candy on the piece of parchment paper, try and line the paper (a silpat works wonderful here too) in a pan that either doesn't have raised edges or is open on at least two sides. When you flatten the candy with a rolling pin (fantastic method, by the way! ), if you use a traditional four-sided sheet pan, it makes it a little tricky - doable, but tricky. Also, as you top the candy with parchment paper to roll, be sure to leave it there for about 5 minutes once you are done - if you try to tear it off right away, the candy likes to stick a bit, pulling up thin strings that harden quickly into sharp spears! 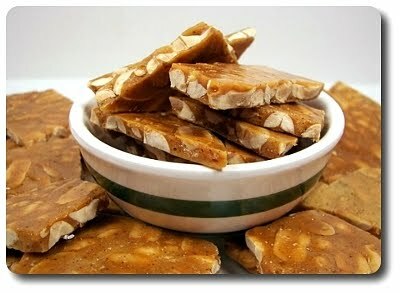 Sweet, a touch salty (salted peanuts are a must!) and a burn that slowly creeps up to take you by surprise, if you love unique treats, this is one you can't pass up! If you missed our first post and would like to read about our first foray into this intriguing brittle, check it out here. 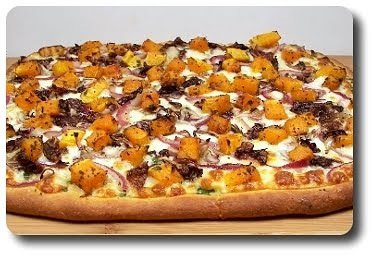 We're finally back with another new pizza to share for our weekly Friday Pizza Nights! While we've continued to make pizza on Friday, these past couple of weeks have been easy repeats from the past out of necessity and comfort. 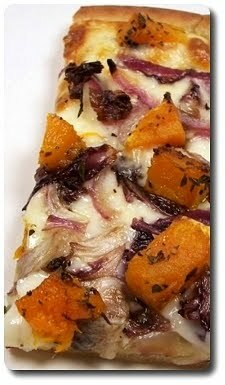 I don't think Jeff would have described this Butternut Squash-and-Red Onion Pizza as one that would be ideal for him because I definitely got "the look" when I said "Hey, guess what we're having on pizza tonight? Squash!". I just took it in stride and replied "too late... that's all we got!" - hee hee! 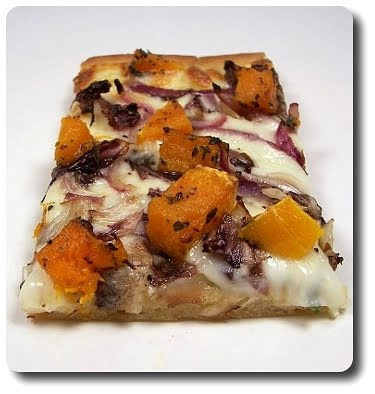 Since the squash would take too long to cook if it was thrown on the dough raw, the cubes are roasted to give them a head start. It won't take too long since the oven is already headed at a fairly high temperature to cook the pizza - we did drizzle the cubes with oil, then seasoned then with fresh thyme, salt and black pepper. Rosemary also might be nice instead of thyme, or you could forgo both for a more pure flavor. With the squash roasted to a light golden brown, yet not completely tender, we stretched our favorite homemade whole-wheat dough into a large rectangle on top of a piece of parchment, then slathered the top with a wicked combination of extra-virgin olive oil, a large clove of garlic and chopped fresh parsley. So the toppings can visually shine on top, the cheese goes onto the dough first - we used mozzarella, diced into small cubes and scattered all over. After the cheese, we took thin slices of red onion and radicchio and dressed them with a smidge more of that fruity oil, then added the squash right into that same bowl and arranged the vegetables over the cheese. 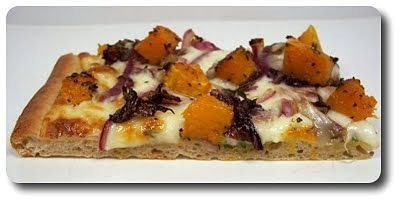 Slid onto the same sheet we roasted the butternut on, the pizza bakes until the cheese bubbles and oozes over the bottom, the squash finishes roasting through and the crust turns golden and crisp. I decided to take a few bites before Jeff did just to see if I had better figure out something else for him in a hurry, but when I found how the sweetness of the tender golden squash turned out to be just the right contrast to the slightly bitter radicchio and pungent onion, I had a feeling Jeff just might dig this after all. And with a gooey pool of melt-y mozzarella underneath, how could he not? And guess what? He loved it and even took a trip back for seconds - will wonders never cease! With Thanksgiving right around the corner (next week! ack! 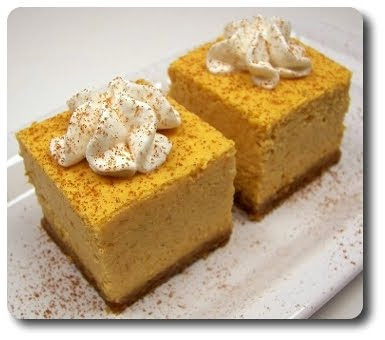 ), we thought it was only fitting to try and work another pumpkin treat into the Weekly Wednesday Treat Day schedule. Cookies actually jumped into my mind first, but after looking in the fridge and finding the mess of cream cheese we scored the other week during a sale, my plans had to change. I'm sure you can guess what I went looking for, right? Cheesecake, of course! 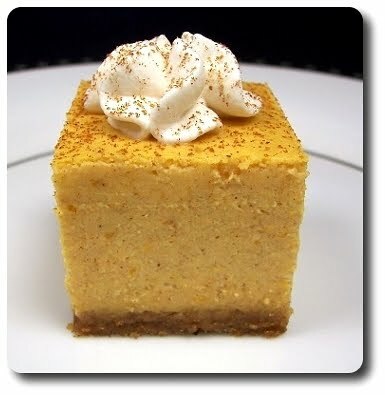 We settled on these Pumpkin Pie Cheesecake Squares not only because they sounded good, but we wanted a recipe that was rich enough to cut into smallish servings to have enough to go around. Up first was the crust, made from crushed vanilla wafers that we lifted up with brown sugar, ginger, strong Vietnamese cinnamon, cloves and a pinch of salt. Graham crackers may work well here, as well as animal crackers, if you don't want to go the vanilla wafer route. Bound together with melted butter, the moistened crumbs are packed into an eight inch pan - be sure to press them evenly over the bottom and up the sides. If you find this difficult to do with your fingers, the flat bottom of a small measuring cup works wonders to speed this along. Baked just to set the crumbs, the crust is removed to cool while the cheesecake batter comes together. The recipe calls for heating the pumpkin with sugar and spices (echoing the same in the crust, minus the clove and replacing it with fresh grated nutmeg), which thickens the mixture slightly and perks up the spices. I'd do this even if you were simply using canned pumpkin - it is an extra step, but it seemed to work well! 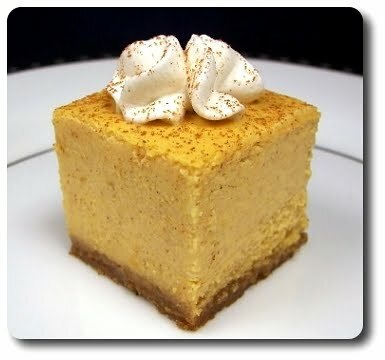 Once heated, the pumpkin turns decadent with a heavy splash of cream and is set aside to cool off. The rest of the filling is cream cheese, beaten until velvety smooth, then mixed with eggs and a few potent drops of vanilla. When adding the eggs, try not to dump them in all at once - beat them in one at a time, only mixing until just blended, before adding the next. With a portion of the cream cheese mixed into the cooled cream-laced spiced pumpkin concoction, the two are finally combined to form the pale orange filling that will be poured into the toasted crust. For doneness of this almost-filled-to-the-rim treat, you want the outer ring of the cheesecake to be slightly puffed, a little golden and firm to the touch, but if you were to give the pan a gentle shake, the center should still have a good wobble to it. Sadly, you can't rush in to slice out a piece- the cheesecake needs to cool, then chill to allow the filling completely set. Don't rush the cooling process and don't cover the cheesecake until it is at least room temperature. If you cover it and place the pan into the refrigerator while warm, the top may end up riddled with water droplets - you can quell this by securing a paper towel over the top of the pan (not touching the cheesecake) if you absolutely can't wait, but it is best to just let the cheesecake take its time. You can divvy this out as you see fit, but as mentioned, we went on the smaller, bite-sized side by slicing it into twenty five squares (5 x 5 cuts). 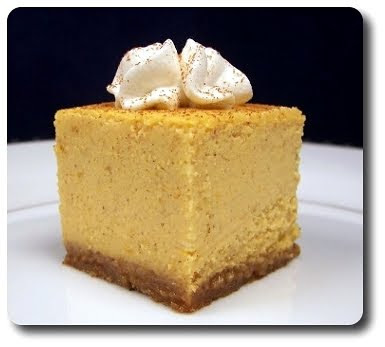 The filling is luscious and pleasantly spicy, with an upfront pumpkin essence that is tempered by the mellow cream cheese. We quite enjoyed how the crust was seasoned to play off the comparable flavor in the cheesecake, yet had its own unique presence from using the vanilla wafers and indulgent scoop of brown sugar. We felt the need to gussy them up, just because, which was easily done by whipping fresh cream with a scoop of confectioners' sugar and vanilla. Plunged into a pastry bag, fitted with a star tip, we pipped a sweet kiss on top of each square, with a tight sprinkling of cinnamon to finish them off. I'm back with another recipe filled post to try and catch up on our meals! I do have a small kitchen update - the work is almost complete, save the large granite piece for the new cabinets. We had planned on trying to match what was already in place, but it has been a few years since the previous owners did their kitchen renovation and while the slabs of stone we looked at recently were close, it wasn't exact. It would have looked like we did a poor job trying to match it. In the end, we chose a piece that drew on the same colors, yet had a completely different flow - hopefully this was a good choice! A recipe for Walnut and Rosemary Oven-Fried Chicken is up first. 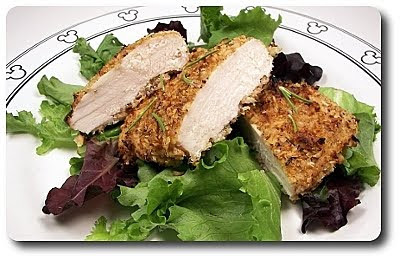 This is a flavorful, yet simple, take on oven-fried chicken that Jeff and I both said we can't wait to make again after we cleaned our plates. I say simple because there is no typical triple breading process involved - just a leisurely dunk in tangy buttermilk and Dijon mustard combo, then a quick dredge through the crunchy coating. This isn't any ordinary breadcrumb coating either - made from panko breadcrumbs, chopped walnuts, a bit of Parmigiano-Reggiano cheese and fresh rosemary, the mixture definitely speaks for itself. Panko is already texturally crisper than regular breadcrumbs, but to give it an edge, we gave the crumbs a light toast in a skillet first. Instead of putting the chicken on a baking sheet, where the bottom usually ends up fairly soggy using the oven-fried method, we placed them a rack to allow the hot air in the oven to flow all around the sides of the chicken. If you don't have a rack, I'd suggest pre-heating the baking sheet for 5 minutes or so to get it rocket hot - this way the crust on the bottom gets a jump start. When the fresh corn was practically singing off the farmers' market stands with sweetness as they came into peak season, we snatched a ton of ears. We ate much of it right off the cob, but like squirrels, we stashed a good amount of it in the freezer for later use. We thawed some of it recently to bring a taste of summer into this chilly fall weather, making this Fettuccine with Fresh Corn Pesto for dinner. The corn "pesto" was fantastic and a snap to make, with the corn and garlic first cooked in a couple spoonfuls of bacon fat for a bit of richness. Made like a regular pesto, blitzed in a food processor with Parmesan cheese, pine nuts and quality extra-virgin olive oil. It does make much more than I'd comfortably feel dressing a measy half pound of pasta the original recipe called for, so I bumped up the pasta to 12 ounces and felt that was a better fit. 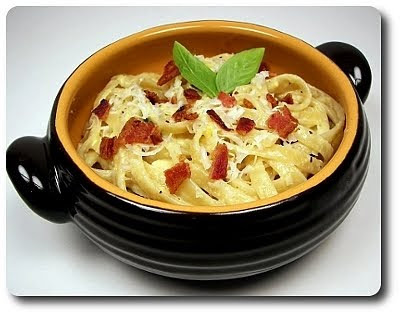 Don't be concerned if you find the pesto quite thick after being made - once it is added to the hot pasta, a few splashes of the starchy cooking water will thin it out nicely. 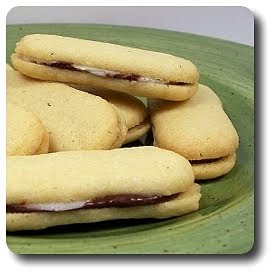 We thought this was quite creamy, especially with no dairy cream involved! The other dish we made in the past couple of weeks, Broccoli, Beef and Potato Hotdish, was prepared mainly because we needed a good dose of comfort on one of the first fairly chilly days we have felt since moving to Charlotte. The recipe is a take on a classic hotdish-type meal (and given my extreme pickiness growing up, in Minnesota where hotdish is a staple no less, I never could bring myself to try it), though this is made with a healthier spin to it. Underneath the crispy topping is a mixture of browned ground sirloin, onion and fresh garlic, seasoned with ample amounts of Worcestershire sauce and garlic powder. 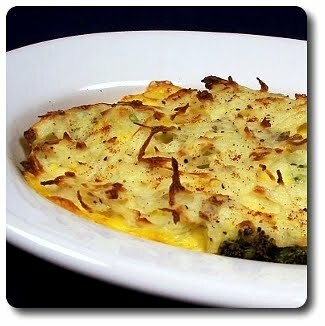 On top went a generous amount of roasted broccoli, followed by a drenching of homemade sharp cheddar cheese sauce. Rather than tater tots, which you are more likely to see on top, this take uses shredded potatoes mixed with an egg, hot Hungarian paprika and cayenne pepper for zip. We made the shredded potatoes fresh from a barely boiled russet potato, but you could make life easier by using frozen (or even the refrigerated variety if you can find them) shredded hash browns. We prepared this in individual baking dishes, but feel free to go family-style - just layer all the ingredients into a larger 9" x 13" pan. 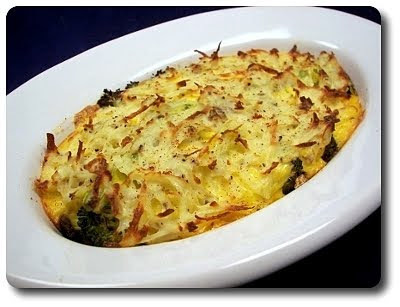 You could also prepare this up to the point of adding the hash browns a day ahead of time and keep it chilled, or stash it in the freezer, unbaked, for a couple months - just let it thaw in the refrigerator for a couple of days, then let it stand at room temperature for half an hour before baking to serve. One more time.... with popcorn! 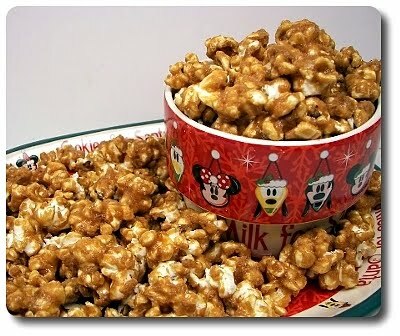 Before I even got a chance to figure out what we would be preparing for the Weekly Wednesday Treat Day, Jeff asked if I would think about making that wickedly addictive Gingerbread Popcorn we usually save for the holiday baking spree. His "so-called" reasoning was something about his team would likely be in meetings most of the day and the treat would need to be easy to eat and very portable. However, I think he just wanted the darn popcorn and didn't want to wait until we start the annual baking craze. While it won't be a new recipe for us, at least his co-workers have never had it! I won't go into our regular spiel since I've already talked about this intoxicating goodie a ridiculous amount of times. If you happen to be new to the site or missed the other posts, then this is one of those recipes that I highly suggest you try, especially if you are a fan of sweet popcorn. 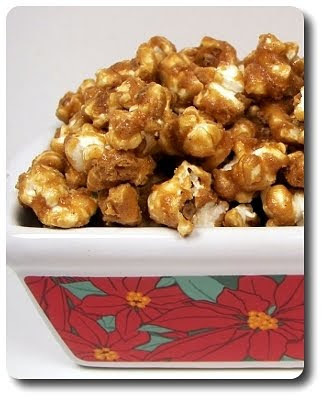 There really isn't much to fuss about this recipe - there is not even a need for a candy thermometer as you just need to boil the ginger-spiked, brown sugar and molasses concoction for five minutes, pour it over the popcorn and let it do its own thing in the oven, stirring a few times, until the popcorn is crisp, crunchy and need I say it again, addictive! Don't miss out! I've been meaning to get this post I'm about to do for way too long - life has definitely been butting in lately and it has been hard to find the time to sit down long enough to write it out. 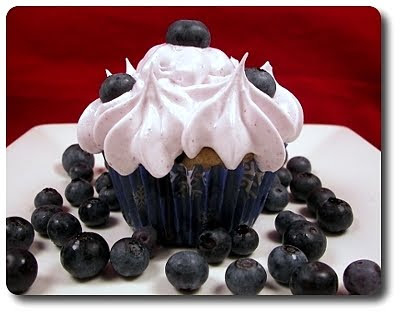 It may have been several weeks since we made these Blueberry Cupcakes using fresh berries we picked up at the market, but Jeff still brings them up often - that's a good sign! These cupcakes have a secret ingredient, one you definitely wouldn't expect - plain mashed potato! All you need to do is boil up a peeled buttery Yukon Gold, drain the water away and mash it as smooth as you can get - don't use leftover mashers that have been seasoned with who knows what. You do want this to cool down before you use it - be sure to start this process before you get anything else for the cupcake batter ready. The potato adds plenty of moisture, allowing you to cut back on the fat a bit, without compromising the texture of the cupcake. To keep the crumb tender and soft, yet still add nutritional boost, we used a combination of flours - equal parts of soft cake flour and whole-wheat pastry flour. When we have add-ins to batters, fresh blueberries in this case, add them when most of the flour has been moistened, yet you still see some dry flour-y spots. This way, you'll finish incorporating the batter and get the blueberries worked in, without worry of over-working the mixture. Cupcake batter typically fills the baking tins about two-thirds full when all is said and done, but be prepared to fill them right up to the top with this recipe. These cupcakes are done when they either spring back when lightly pressed in the center or a toothpick comes out with a few moist crumbs attached when inserted in the center - both methods work well, just use whichever you are most comfortable with! Whisk the muffins out of the tin as soon as you can fingers can stand it - try not to leave in any longer than 5 to 10 minutes as the bottoms will steam and become tough. 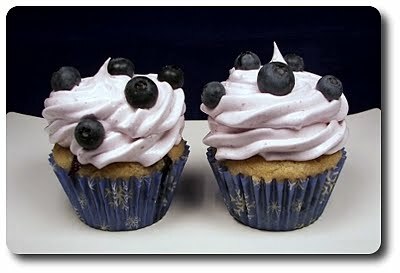 The frosting for these cupcakes is very cloud-like being light and fluffy, almost marshmallowy, with a tinge of color and flavor coming from a couple scoops of blueberry preserves. I did press our preserves through a fine mesh strainer so we'd end up with a smooth color, but feel free to skip that or use a blueberry jam. 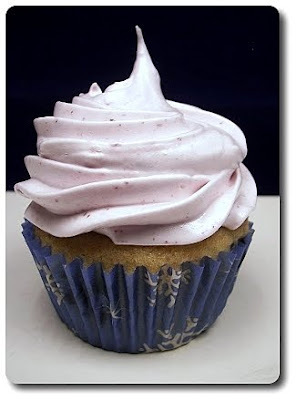 You won't have to be skimpy with this icing at all either - because it is so airy, you'll have plenty to go around, adding a small mountain on top of each cupcake. The frosting does stiffen as it sits - be sure to get it onto the cupcakes as soon as you make it. Because we know where we get our eggs from, it didn't bother us in the least to use them in the frosting. However, if you get squeamish with the thought of using egg whites like this, you could either try using pasteurized eggs or use dried egg whites, reconstituting them according to the directions on the package (using enough to make up 2 whites). 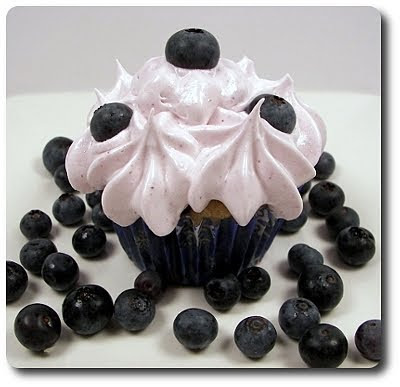 If you're a fan of the blueberry and coconut mash up, you can infuse a bit of coconut flavor into these golden cupcakes by swapping out the vanilla for about 1/2 teaspoon coconut extract in the batter, then add 1/4 teaspoon to the frosting as well. 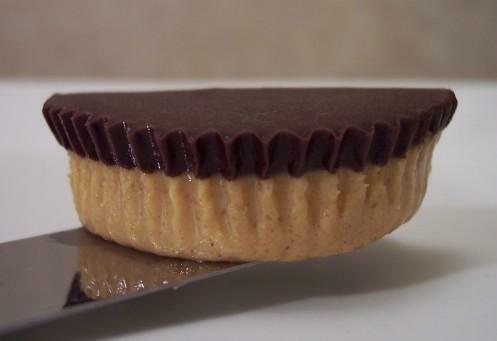 As I've mentioned more times than I'd care to admit, one of my favorite pairings with chocolate is peanut butter, but there is definitely a close second - mint, usually in the form of cookies or candy confection... Peppermint Patties anyone? However, I haven't been able to indulge as much over the past couple of years due to reflux issues (don't even get me started about how sad this makes me). I threw caution (and sense!) 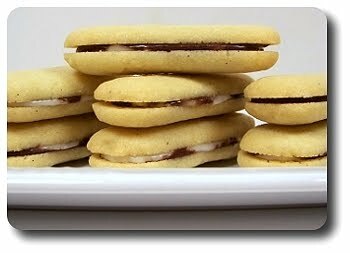 to the wind for this week's Wednesday Treat Day though, making these Mint-Chocolate Sandwich Cookies for Jeff to bring in to share with his co-workers. You have a couple options when it comes to getting the vanilla-scented cookie dough onto the baking sheet. I did use vanilla sugar I've had stewing in a mason jar, but regular granulated works fine. Scooping the dough into a pastry bag, fitted with a larger plain tip, will give you the most consistent result, but you don't have do that. A sturdy zip-top bag will work well - just snip about a 3/4" hole in one of the corners and squeeze the dough in that direction. The cookie may be a little uneven, but they still taste the same! I did this myself as all our open-style tips were too small. With all the manhandling of the dough to get them onto the sheets, before the cookies are baked, the pans are slid into the refrigerator to chill the dough, helping the cookies keep their shape as they bake. Keep the cookies in the oven just long enough to give them a golden ring around the outside, yet keeping the tops light for the best texture. Do be sure to use a delicate hand when transferring the cookies to a wire rack to cool - they are fairly fragile while warm, but firm up nicely as they cool. 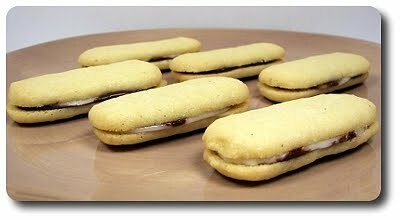 To sandwich the cooled, crisp cookies together, on the flat side of half of them, we slathered melted bittersweet chocolate (semisweet would also be appropriate). To bring the mint side in, we coated the other side with a sweet concoction of confectioners' sugar, peppermint extract and just enough water to make for a spreadable consistency. If the thought of mint doesn't float your boat, think about orange, raspberry or even almond extract instead to play off the chocolate. I do have to say, and Jeff agrees, these treats are pretty darn close to those packaged Mint Milano cookies, with the exception being they are not all perfectly formed soldiers and they tend to be a bit messy to eat (though I have a feeling they will firm up more as they sit overnight - we tested them right as we sandwiched them together). Yes, there may need to be some finger licking to get any of the filling off, but I won't tell - I did it too!